As a child Nigel’s favorite game was hide and seek. The young boy was always begging his siblings and neighbours to play with him, and usually they would agree. During the better weather, the children would all play together outside, running and hiding in trees and bushes or ducking behind buildings and crates. In the less pleasant weather Nigel would play with his siblings inside, hiding beneath beds, behind curtains, or under tables. Most of the kids loved the game, and some were quite good at it; Nigel was not. The young boy’s feet could often be seen dangling from a tree branch, his legs protruding from a bush, or his back raised higher than the furniture in front of him. His eyes were closed or covered each time, and assume since he couldn’t see anyone, they couldn’t see him. Little Nigel truly believed he excelled at the game. His friends and siblings, who were all older than him, were usually kind enough to humour him, and so Nigel continued to think of himself as a stealth master. When Nigel wasn’t playing hide and seek he was listening to tales told by his neighbour, a kindly older man. The tales of heroic adventurers and city savours who were capable of a great many deeds inspired Nigel, and the boy began to dream that one day he could grow up to be the stuff of legend. The wise old man often reminded Nigel small acts of kindness and bravery went a long way, and so Nigel endeavoured to do all he could for those around him. Nigel’s hometown was a quiet, sleepy village, and remained so through his youth. Playing games of tag, hide and seek, and exploration was as close as Nigel came to any grand adventures, though he was always quick to stand up for his friends. Nigel called out any wrongs he saw, tried to include everyone, and ensured any game played was fair for all participants. When Nigel turned eighteen he knew in his heart it was time to find his fortune on the road. 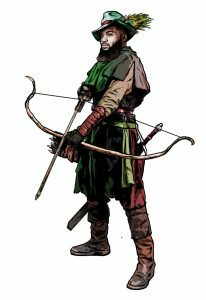 Armed with a pack, a bow and arrows, and a sturdy pair of boots, he set out determined to help make the world a better place. In many towns, Nigel was hardly needed. The residents respected each other, and when they didn’t, the law was just and fair, but in one city he came across Nigel discovered immense corruption. Determined to bring justice to those who resided there, Nigel approached several people who were contributing to the problem, asking them politely to change their ways. When they brushed him off, Nigel would wait for them outside their businesses and offices, eager to try once again to help them see reason. Unsurprisingly, these methods proved futile for Nigel and bothersome for the subjects. Nigel’s insistent meddling did little to ease the burden of the suffering citizens, but the corrupt council grew weary of the time they wasted on the matter. After several weeks of this they hired a pair of thugs to show the meddlesome do-gooder the error of his ways. The beating was severe, but Nigel was left alive. Determined not to give up, he bid his time, recuperating from his injuries and trying to find a new approach. By the time Nigel could move about without too much pain, he realized it would be best to operate under a guise. 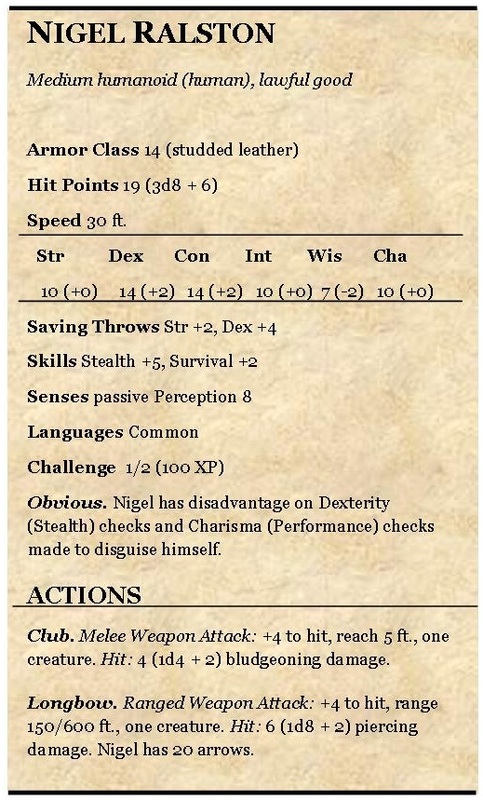 Certain a series of disguises, combined with his prowess at hiding, would allow him to fight the corruption from the shadows, Nigel strengthened his resolve to bring peace to the residents. While passionate about his disguises, Nigel is not much more capable at creating them than he was at hide and seek as a child. Details allude the young man and he has, on more than one occasion, forgotten to scrub and trim his nails before impersonating a noble, or worn high quality footwear when impersonating a beggar. Most of Nigel’s disguises can be seen through by all but the most casual of observers, though the young man puts a good deal of effort into them, going so far as to create detailed backstories for the roles he plays. For some time now, Nigel has been watching the local powers, amassing what knowledge he can while remaining hidden from their prying eyes. He has yet to make any overt moves, and any information he has is mere speculation. Nigel is making plans to acquire concrete evidence of wrong-doings, but the last time he approached the office of one of the council members, Nigel was surprised to find himself spotted by a very perceptive guard and he abandoned the operation. Nigel is once again bidding his time, unaware the council’s current lack of concern regarding his actions is due to their belief in his incompetence. As a precautionary measure, one of the council members has sent her low-level-lackey to follow Nigel, a fact the would-be-hero is blissfully unaware of. 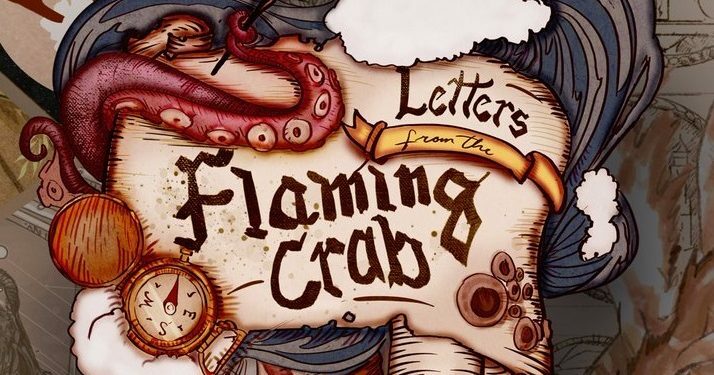 Are you familiar with Letters from the Flaming Crab? If not, it is a monthly series of Pathfinder-compatible supplements; each Letter focuses on exploring a different topic to give gamemasters and players new, exciting options that can be dropped into any campaign. We’ve talked about them before (Murder Bunnies, Dinosaur Companions, Gnomes vs. Gremlins, and Household Magic Catalog), and we’re back again about the most recent one. 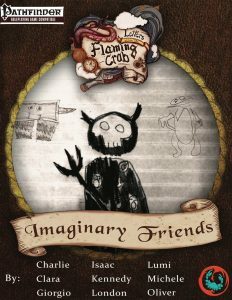 Letters From the Flaming Crab: Imaginary Friends features a new type of creature: imaginary friends! These ghost-like creatures assign themselves to children and act as companion and guardian to their chosen ward. Each has a different appearance, shaped by the imagination of the children they protect. Rugrat #1 and Rugrat #2 had a great time with this project, and Rugrat #1 even went so far as to write two of the imaginary friends found within the magical pages. His growing love of Pathfinder, combined with an urgent need to acquire enough money to purchase a new package of Pokemon trading cards, meant working in the gaming industry was the best thing ever. While we don’t love his obsession with those cards, we had to applaud his work ethic on their project, and his desire to take part in RPG design. Truth be told, both Ken and I think Rugrat #1 could make an excellent GM in a few years, and FCG giving the next generation a chance to test the waters is a really cool thing. Rugrat#2 brought his favourite stuffed elephant (named Ella) to life, while Rugrat #1 created two monsters whole-cloth. 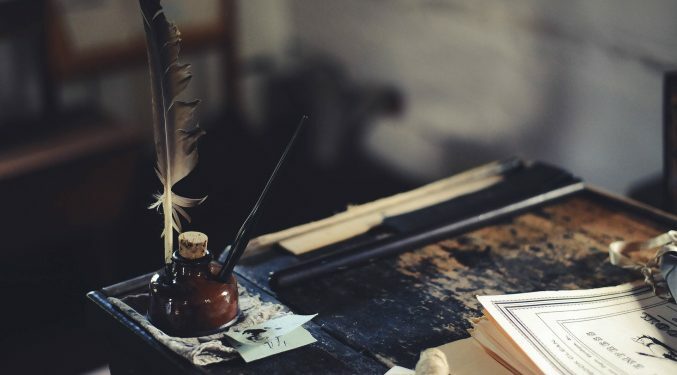 His creativity in their abilities, what they were, and how animatedly he described them admittedly surprised us, even though we know he’s an avid reader with a pretty cool imagination. Rugrat #2 mostly held onto Ella in a loving/territorial fashion while we asked a lot of questions, but I could sense his excitement hidden behind the understuffed lovie. The colour illustrations included in the PDF were all created by the contributors, and watching our rugrats focus so intently on creating these imaginary friends was so enjoyable. They colour a lot, but we see way too many Pokemon, so watching on as Rugrat #2 painstakingly drew his beloved Ella, well it was a nice change. For people worried about the stat-blocks for the imaginary friends, rest assured they were created with input from the children named in the project and then (at least in our house) written by the adults before (per usual) being edited and developed by the amazing J Gray at FCG. I’m a little biased, but I whole-heartily recommend you hurry over to DriveThruRPG and pick up this fun little PDF. Then, when your PCs make trouble in town, you can put them up against something a bit different: the imaginary friends of the local children. Earlier this year the Dire Rugrat team started thinking about goblins. The way we saw it, goblins are an often used enemy in role-playing games, but they have become typical; PCs know what to expect when they see them. We wanted to bring some life to these poor little creatures, really give them a chance to shine for their 15 minutes of fame, so to speak. What better way to do that than 18 unique goblins, reminiscent of our Bullies & Brutes collection with the common thread being, well, goblins. So many goblins. As we set to work building a collection of goblin NPCs, we realized we wanted to do more than just add some unique abilities to the same old goblin stat block: we wanted to address the lack of variety. To be fair, unlike some systems, 5e makes it relatively easy to customize NPCs, but even still, goblins were goblins. And so we ended up creating Moar Goblins, a mini-bestiary featuring a sextet of goblinoids adapted from a variety of real-world cultures. Back when that came out last April, we shared details of the PDF, including a sneak peak of one of the goblin sub-races. The book received a great review (and 5 stars) from Endzeitgeist. Beyond the basic builds, which all have at least one intriguing feature, it is undoubtedly the copious flavor and inspiring supplemental text that makes this pdf come into its own; it s also a big, big plus that this does not simply regurgitate the same tired creatures we have seen over x editions and instead opts to go for the uncommon and novel, drinking deep from the wellspring of more obscure myths and legends. It also substantially delayed our progress on the NPC collection. The pesky little creatures seemed to be everywhere like gremlins in the gearworks of our lives. Fittingly, perhaps, it wasn’t that one goblin was a problem, it was that there were so many. After a lengthy delay, we have finally chipped our way through the biographies and stat blocks of 18 different goblins. There are over 35 pages of NPC content and while all of the characters in the book are a goblin of some sort, numerous racial variants, capabilities, motivations, and challenges (ranging from 1/2 to 12) mean your PCs will never look at goblins the same way again. Some of my favorites include the capable psychic goblin twins, Nix & Zub, the ever-helpful gudro bonga Eakogs Clutternugget, and the tokoloshe traitor N’tambu. If you love a little demonic backstory with your goblins, look no further than Flubboks Hugemitt, but if complicated family dynics is your thing, you’ll want to check out Neeha and Vaishik – these gudro bonga have a few family matters to sort out, assuming the PCs don’t wipe them and their children out. A lot of love went into these NPCs, so much so it saddens us a little bit that your band of adventurers may just want to wipe out these poor unfortaunete souls just because of their race. 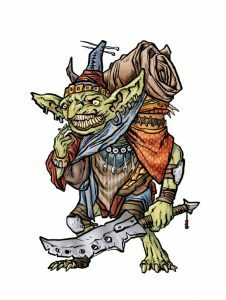 We hope you’ll consider checking out this colourful collection, and showing your PCs that goblins can be just as diverse as any longshanks. 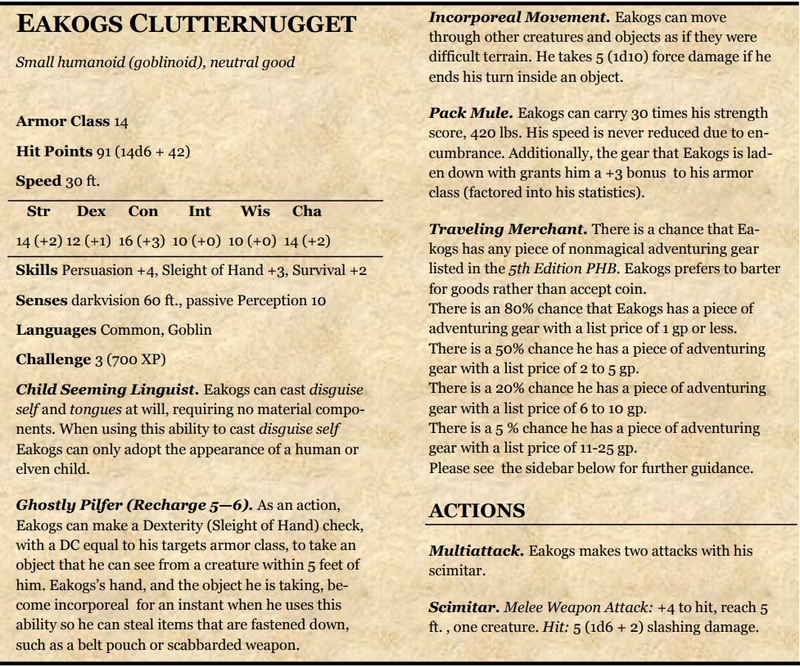 To that end, we present Eakogs Clutternugget, a sneak peak at the offerings inside 5e NPCs: Goblins! Goblins! Goblins! A great many years ago there lived a goblin who desired little more than to assist weary travelers. Through chance, he had come to be in possession of a magical drinking horn that produced the most delicious beverage imaginable and sated even the most parched traveler. Atop a hill in what seemed like the middle of nowhere, the benevolent goblin resided. When a traveler stopped to rest his weary feet and called out for water, the goblin appeared, as if by magic. Always dressed in a red cape, the goblin would provide drink to those in need. Most were incredibly grateful, and word spread of the benevolent goblin and his incredible beverage until one day a traveler came through not looking for aid, but for the horn itself. When the goblin produced the magical vessel the traveler snatched it and jumped upon his horse, riding off into the distance faster than the goblin could follow. Heartbroken, devastated, and feeling betrayed by those he had assisted, the goblin retreated into his hidden hilltop home. His child, Eakogs, who had long watched his father’s good deeds was perplexed. 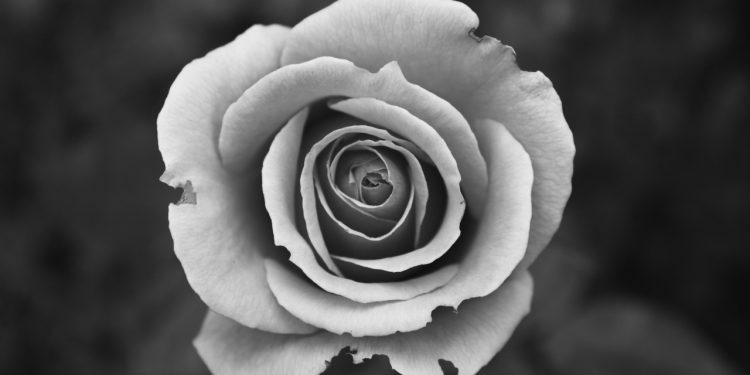 What would possess someone to take something which did not belong to him? How could his family aid those in need now? Travelers continued to arrive at the hilltop hoping for a respite from their difficult journey. With the drinking vessel stolen and the benevolent goblin’s spirit crushed, their hopes were dashed. Over time fewer and fewer people made their way to the valley hilltop and fewer still hoped for that magical beverage. Tales of encounters with the benevolent goblin stopped being shared and he became something of a myth or legend that could no longer be substantiated. Many a time Eakogs asked his father if they could assist the travelers in another way, but the betrayed goblin bid his son stay inside the safety of their hidden hilltop home lest they lose any more than they already had. For years Eakogs watched and puzzled over how he could restore his father’s spirit, and do his part for the world. When he came of age Eakogs set out, promising his father he would return with tales of generosity, both his own, and those of the beings he encountered. Secretly, Eakogs hoped he could also find the horn, but he feared raising his father’s hopes. Eakogs began to roam the world, offering assistance to those in need. He quickly discovered that many beings were leery of goblins, while others were outright hostile. Still, Eakogs made peace with many a traveler, providing goods from his laden down pack and often going without if he stumbled on those less fortunate. While he carries a weapon, Eakogs uses it for only for self-defence. He is furious if anyone attempts to steal from him, certain the world would be a better place if everyone shared and was kind to each other. Eakogs prefers to trade items rather than sell them, though he happily accommodates shopkeepers who have no need for the goods he carries and would prefer coin. This strange but optimistic goblin continues to search for leads of his father’s missing horn, and would be eternally grateful to any adventurers who helped him locate it.